【2 IN 1】-Equipped with two connectors: USB 3.0 and USB type C. Allowing you to easily transfer files and data between smartphones, tablets and computers instead of using cloud services. Instantly free up space or quickly move content on your OTG enabled phones or tablet. 【HIGH PERFORMANCE】-High-speed 3.0 data transfer speeds up to 80-120MB/s (read) and 15-25MB/s (write) which 5 X faster than standard USB2.0 drives , save more time and effort when transferring and uploading files. 【EASY TO CARRY】-Small, pocket-sized for easy transportability, especially for phone using.Connect and play,enjoy movies or musics stored in the flash drive when you are on trip or travel. 【DURABLE】-High-quality metal casing for durability. 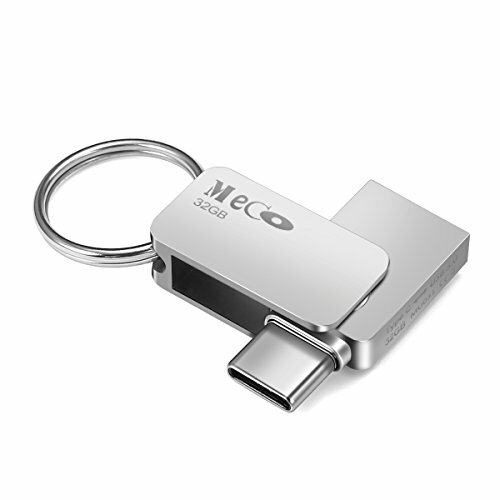 Water proof, Shock proof, magnet proof, temp proof, and X-ray proof .Comes with key ring which helps you to connect it your keychain, bag, briefcase or purse and forget the thought of losing your data and important files kept in the drive. 【WHY CHOOSE US】 -Dual drive make it have verstaile compatibility.Compatible with any USB3.1, USB 3.0, and USB2.0 port.One year warranty and 24-hours customer service.